GOLD IN IDAHO - GOLD MAPS FOR GOLD PANNING, METAL DETECTING AND PROSPECTING WITH OVER 4,300 GOLD SITES. GOLD MAPS ARE GREAT FOR GOLD PANNERS, GOLD METAL DETECTING, GOLD PROSPECTORS, ROCK HOUNDS, CAMPERS, HIKERS, AND GEOLOGIST. THE LOCATION AND MINERAL OCCURRENCE OF GOLD FOR THESE SITES CAME FROM EXTENSIVE RESEARCH OF THE IDAHO DATA FILES FROM THE U.S.G.S. DOCUMENTS. 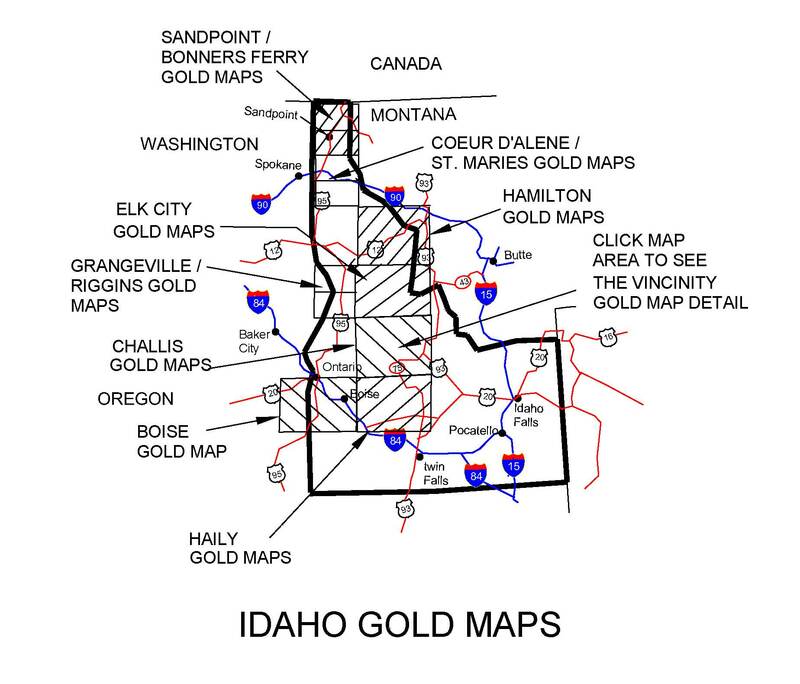 (MRDS FILES) GOLD MAPS INCLUDE GPS DATA AND WERE PREPARED IN THE AREAS OF IDAHO IN WHICH THE MOST OCCURRENCE OF GOLD HAS BEEN FOUND AND ARE LISTED BELOW. There is still gold in the creeks and streams in Idaho. The best chance to find Gold in these creeks and streams, placer deposits, and near old mines and prospects, is to know where the occurrence of gold has been found. Before you dig or pan for Gold you will need a map to show you where to look. These Gold Maps provide you with past gold mines, placers and prospect sites. The venture will be interesting and challenging. When you do make a Gold find it will be very exciting. In the past, it was not uncommon for one to find 1 to 6 ounce nuggets in the streams and placers. Those days may be gone, but with some luck and a lot of determination you may find some gold or even a gold nugget. There are present day stories of modern day prospectors, either panning or using metal detectors, finding nuggets today. Picture above is the American River near Elk City, Idaho, where several placer gold deposit sites are shown on the gold maps. The gold sites are noted and shown with a numerical number next to each site. The number is referenced to a north latitude and west longitude point. The gold sites are shown adjacent to access roads and streams. The sites are plotted on a USGS topographic map which shows the contours, streams, points of interest, and forest areas of the land. A 'P' next to the record number shows were placer gold deposits have been found. Roads are highlighted in red and old Miners Camps / Historical towns are shown on the gold maps. Hiking trails are noted by a 'H' in a red circle with a 'T' next to it. 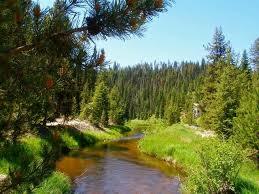 The picture to the right is a creek located in the Sawtooth National forest. Recreational Gold panning is allowed within the National Forest. Full Color USGS Topographic Quad Sheet at 1:250,000 scale. Base Map. How to Pan - steps for panning gold. PLEASE CLICK GOLD MAP AREA TO SEE MORE DETAILS OF VICINITY MAP. The cross hatched areas shows the gold maps that are for sale in the state of Idaho. BOISE Gold maps - 231 GOLD SITES. (includes 17 Placer gold deposits) Towns in the vicinity - Boise, Napa, Homedale, Emmett, Murphy. Ghost Towns / Miners Camps and Historical Towns - 7 Active Gold prospectors clubs claims area. The Boise Gold maps cover a vast area from Boise, Idaho to Vale, Oregon to Murphy, Idaho. There are many gold sites located around the old and historical mining towns of Silver City and De Lamar, located south west of Murphy. There are also several old mining camps sites that are shown on the gold maps near Silver City, that include Ruby City, Fairfield, Dewey and Wagontown. A detailed in depth gold map is included in the set of maps that shows the gold sites around Boise and Murphy. Gold placer deposit sites, where gold has been found, is shown on the gold maps along the Snake River, just south west of Boise along Highway 78. The Challis Vicinity Gold maps consist of four gold maps, which are shown on the detailed map view seen by clicking the cross hatched area of the CHALLIS vicinity gold maps shown above, that cover a vast area of wilderness ranging from the gold placers deposits shown in the Mid Fork Salmon River to Pistol Creek gold placer deposit sites to South Fork Salmon River gold sites to the South Fork Payette River by Highway 21 to the Salmon River gold sites by Highway 75. The gold sites are located in the Boise, Payette and Challis National Forest and the River of No Return Wilderness within the Salmon River Mountain range. There are several miners camps / historical towns shown on theses gold maps which include Stibnite, Banner, Bayhoarse, Bonanza, Clayton and Custer. These gold maps show where the gold has been found and show the access roads, forest service roads, Bridges, and main highways to the creeks and rivers and shows the Sections, Townships and Ranges for each map. ELK CITY VICINITY Gold maps - 876 GOLD SITES. 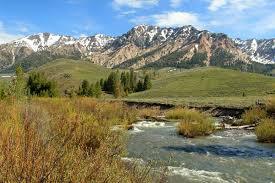 (Includes 252 placer gold deposits) Towns in the vicinity - Elk City, Golden, Dixie, Warren, Shoup, Big Creek. Nez National Forest. Ghost Towns / Miners Camps and Historical Towns - 11. The Elk City Vicinity gold maps consist of four 1:100,000 scale gold maps and shows gold sites from Elk City to Warren to Shoup. Many gold placers deposits sites are shown at the stream and creeks and on the Salmon River. The gold fields are located in the Nez Perce, Payette and Salmon National Forest. (Salmon River Mountains) There are several old abandoned miners camp sites located near Elk City, that includes Calendar, Humptown and Frogtown sites. 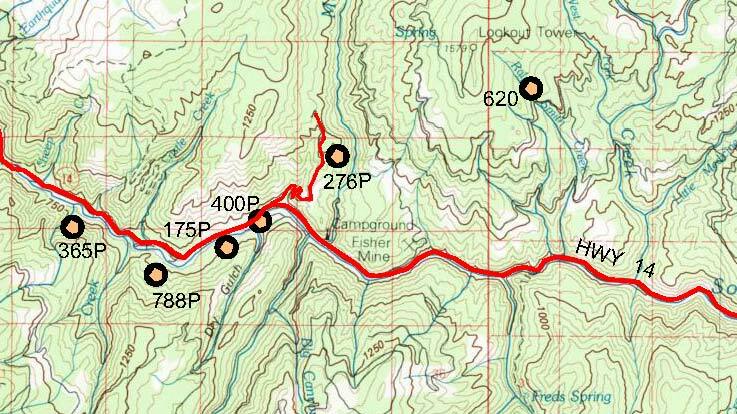 We have provided GPS coordinates for use in finding these miner camp sites. The access roads to most of the gold fields, once you leave the state highways, are by the old forest service roads that take you out into the wilderness area. HAILEY VICINITY Gold maps - 554 GOLD SITES. (Includes 68 placer gold deposits) Towns in the vicinity - Hailey, Ketchum, Sun Valley, Triumph, Idaho City, Rocky Bar, Featherville, Sawtooth, Fairfield, Bellevue, Corl, Picabo, Gannett, Atlanta	 Boise, and Sawtooth National Forest. Active Gold prospectors clubs claims area. Ghost Towns / Miners Camps and Historical Towns - 11. The Hailey Vicinity Gold maps, which consist of three - 1:100,000 scale goldmaps, cover a vast area just east of Boise to Idaho City to Ketchum to Fairfield. (To see these 3 gold maps please click the cross hatched area of the HAILEY GOLD MAPS Shown in the Idaho vicinity map above) The most popular area for panning and metel detecting is in the Idaho City area. There are several old mining camps / historical towns shown on the gold maps, which include Idaho City, Centerville, Quartzville, Pioneerville, and Placerville. Just to the east of this area there are the old miner's camp of Atlanta, Rocky Bar and Graham (site). There are many gold sites and placer deposits in this area. These gold maps clearly identify areas where the gold has been found in the past and show the access roads to the gold sites. Sections, Townships and Ranges are also shown on the detail maps. HAMILTON VICINITY Gold maps - 151 GOLD SITES. (includes 32 Placer gold deposits) Towns in the vicinity -Headquarters, Pierce, Weippe, Kooskia, Lowell, Syringa, Missoula, Victor, Stevensville St. Joe and Clearwater National Forest. Ghost Towns / Miners Camps and Historical Towns - 1. SANDPOINT / BONNERS FERRY Gold maps - 110 GOLD SITES. Towns in the vicinity - Sandpoint, Bonners Ferry, Ponderay, Moyle Springs, Dover, Eastport	 Coeur D' Alene and Kaniksu National Forest. 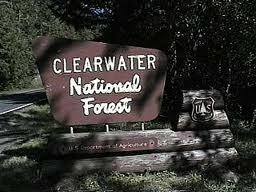 History - the first Gold found in Idaho was in Pierce, Idaho, in 1860 on the Orofino River, now within the Clearwater National Forest. (Gold sites shown in the Hamilton Gold Map.) The prospectors established many mining camps as they eventually spread out to the gold fields near Boise and further east into the Montana territory. The boom lasted until the 1880's. Modern day prospectors still pan and search for gold in these areas. Check out this gold panning song!! To down load it go to Spotify or ITunes and enter Gold Panning Song Tom Hansen in the search box. Follow the easy instructions. Select a target area from our gold maps to pan on and then enter the Township and Range, shown on the gold map, into the blm site along with the state and meridian, (to find the meridian search for "blm meridian maps" on the net) and you will get a printout of active claims in that area. Plot the claimed areas on you gold map and then pan where you won't get on their claims. Please note that active mining claims change on a daily basis, and you must be up to date when you go panning. Enter the gold site's latitude and longitude GPS coordinates (Which are furnished with the gold maps) in degrees in the VIEW box and click and the Township,Range, Section and Meridian will be shown on the screen. Enter this data in the BLM site to find active claims. If you want to see the actual current ground aerial view of the gold site you entered, click the FLY TO box.